A highly modern city center, one of the highest towers in the world, old English charm and lush parks – that’s Toronto, the most populous Canadian city. With over 50% of the city’s population of 2.6 million born abroad, this place is truly multicultural and welcoming to newcomers. 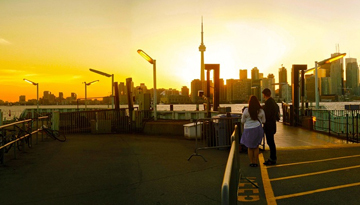 Compare and book cheap flight tickets to Toronto now and dive into the fabrics of a truly intriguing and vibrant city! Toronto was founded in the mid-18th century and first served as a ford before becoming an English trading post. It later grew into the country’s economic and cultural centre and was heavily influenced by Canada’s liberal immigration policies. It was rather recently, in 1998, that the cities of Toronto, Scarborough, East York, Etobicoke, York and North York merged into what is nowadays known as Toronto. They now constitute the 6 city districts. We recommend starting any trip to Toronto the typical Canadian way: by having a good brunch in one of the many amazing breakfast places in the downtown area. Then, head over to the CN Tower and enjoy the views of the city from the bird’s eye perspective. A must on your bucket list for later in the day will be a visit to the Royal Ontario Museum with its great exhibits on natural history and ancient cultures. To see some nice English architecture, take a stroll through the University of Toronto – we’re sure you’ll love the premises of this 19th century jewel! For some ultra-modern touch, and to do some shopping, you should check out the Eaton Centre. If you prefer Victorian flair, the St. Lawrence Market is a must-see for you as well. Being so close to the Niagara Falls, you shouldn’t miss the opportunity to take a bus and marvel at one of the most beautiful spots on the planet. Megabus serves this route several times a day – just book your flight tickets well in advance to save yourself a spot, as the seats are usually sold-out fast during the warmer seasons of the year! Getting around Toronto is a breeze. The city has a metro, an extensive bus network and street cars. However, downtown Toronto is easily walkable! If you want to avoid the crowds of tourists, the best time to travel to Toronto is from March to May and from September to October. The winter months are usually freezing cold, and temperatures can go well below -20°C. In fact, this does have its own charm, but you should come prepared. If you truly want to make the most of your city break in the fascinating Canadian town, you must compare flight tickets to Toronto. With the detailed comparison, you would get the cheap flights to toronto which you always wanted. Fly with Air France Oh Lala Deals, flights to Toronto from London in return economy at £371. 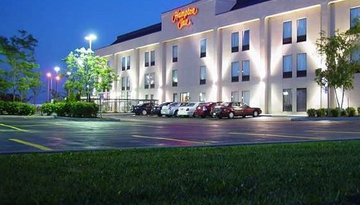 Hampton Inn by Hilton Toronto Airport Corporate Centre is perfect for business stay. 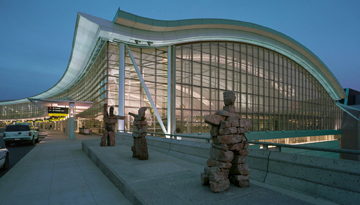 Fly from Gatwick - Toronto & Stay for 3 nights with 3 star accommodation. Room Only.